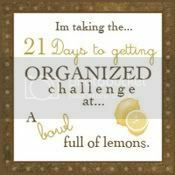 I missed Day 1 of the challenge, which was the junk drawer, but I actually did that a couple weeks ago so I'm not behind. Look at me being ahead of the class. Not. Today's challenge: Clear Off Your Computer Desk. Here's my before. I'm so happy I used the flash so every grimy, nasty fingerprint on my computer was illuminated in full glory. Yes, I had a paint can on my computer desk, complete with paint brush in a baggie. I used it before Christmas to paint a first coat on the trim of the "big stupid piece of furniture I bought from Goodwill which will be awesome if I ever finish it." Gotta love those projects. While cleaning off my desk today, I may or may not have gotten sidetracked into putting a second coat on. The paint can might still be sitting on the floor in my office because I might sand and put the third coat on tomorrow. I did remember to wash the brush this time, though, just in case I flake out. I cleaned out a seagrass organizer I already had and filled it with letter sending supplies. Stamps, envelopes, a notebook for jotting down ideas, mailing labels, and a nice fat stack of cards, including some handmade ones I had forgotten about. The compartment on the left is for my usb cords and computer remote. And with all that stuff moved, a little Pledge action, and turning on a lamp, my desk is much more inviting. Which is why I'm sitting at it, blogging at midnight, instead of sleeping. The rest of the room is still not looking too hot, so I can't wait to see what tomorrow's challenge is. It's not too late if you want to join me! Yeah, notice how closely zoomed that picture is Kar? It's because the rest of the space is NOT so tidy. My "creative space" got buried in an avalanche. I don't know if it will be unburied until we have some new shelving installed, which will be in March. looks like great progress to me! a lovely little nook just for you to enjoy - perfect! Yipee for you!!! I might clean my desk now. . . I would like to give you a bid for the shelving you would like. When would you like to set up a time to meet? Looks good! I'm in the midst of organizing too (which is what I SHOULD be doing right now). Your desk looks awesome, great work. Thanks for stopping by my blog today. Im trying to keep up with the challenges but it truely is a challenge. I'm going to take a minute and look around your blog, come back and visit soon.